We shall be going through few more experiences in today's post. 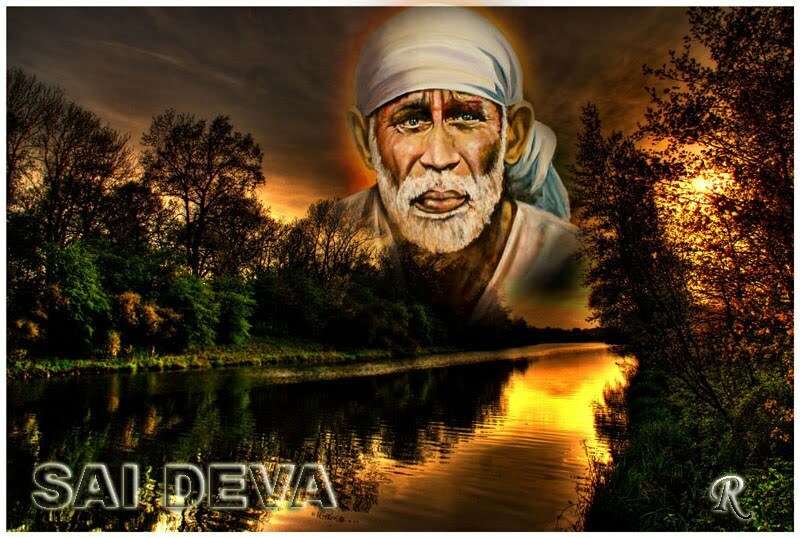 Sai Brother Sreenivas Ji from USA says: Dear devotees of Lord Sai, Good morning to you all. Let Sai Baba's blessings be bestowed on human race. I am here to share my experience with Sai Baba and also to tell you to have one of best and informative website. I am very happy to inform you that I am an ardent devotee of Shree Sai Baba since 2007. In fact most of my family members are His devotees. My late father was an ardent devotee of Shree Sai Baba. I am an Indian from Bangalore and currently in Florida and working in health care professional. I am married with a wife and has 8 year old daughter. I would like to share my experience of Baba with you. It was during Feb 2007. I was diagnosed to have rare right epididymal tumor with a questionable infiltration. I was diagnosed to have a palpable tumor approx 1.8x2.0 cms as per ultrasound and CT scan. I underwent lots of treatment to rule out possibility of infectious source. Later, I was asked to undergo explorative surgery at Mayo clinic at Jacksonville, Florida without further delay. You know Mayo is one of world's best hospitals in ontological cases. I was very much disturbed with my medical condition and was very apprehensive about the aftermaths of surgery. I left US for Bangalore immediately and consulted about 4 different urologists in Bangalore. All of them asked me to undergo surgery without delay. You could imagine my state of mind at that time. The surgery would change my entire life, compromise my job back in the US, which was fetching me approx $200,000 a year and most of all my marital life. I was Very depressed. At this point of time, my eldest sister, who is an ardent devotee of Shree Sai Baba, asked me to read Sai Baba's book-Sai Satcharitra (Sapthaha) with in a week's time. You will be surprised to know that size of the tumor started to shrink from the 3rd day of reading the book and totally gone by the end of a week. Doctors were amazed to realize that there was no palpable tumor during my visit after 10 days. Could you imagine what it meant in my life? Honestly, I did not know much about Shree Sai Baba before this incidence happened. I visited Shree Sai temple at Shirdi in the month of April 2007. That was my first visit to Baba's temple. Let me tell you a strange thing happened at Baba's temple on the day I visited temple. It was around 3.30 in the morning, when I had Baba' Darshan for the first time in my life. All of a sudden, when I looked at Him, I closed my eyes and I saw a huge bright silver idol of lord Vishnu (Narayan) with a violet colored shalya and in front of Him, there was a huge idol of silver cow with a violet colored thread around its neck. Next thing, I noticed was that I had tears coming out of my eyes. Even today it amazes me. I had never come across such as strange experience in my life. I tried to ask my sister about the significance of the strange picture swept over me during Darshan. She told that was Lord Vishnu with Kamadenu. Baba protects me and my family where ever I am. His ways of showing grace is unique. Since then, I visit Shree Sai temple frequently in a place called Inverness in Florida. I feel that I am blessed to have Sai's grace. Sai Brother Bal Krishna Ji from India says: I don't consider myself a Sai devotee. On the contrary, I always have a feeling that Baba is very kind that in spite of my all odds, He has given me SHARAN in His feet. We all (I and my family) are grateful forever for His KRIPA and ASHIRWAD He has showered on us. Once in Shirdi after the Shej Aarti, when I came out of Samadhi Mandir, I saw a long queue for Prasad. Since I was supposed to go for Parikrama of Gurusthan, I have decided to go there. But somehow, I was not finding myself comfortable because of the fact that I have not got the Prasad. I consoled myself and took this as Adesh (“Order”) from Baba. I started Parikrama at Gurusthan. A lady was also doing the Parikrama at Gurusthan with me. Suddenly that lady, while doing Parikrama, said SAI RAM BHAIYA, PRASAD Leijiye (“take Prasad”). Since then till the time of completing the Parikrama, I could not able to hold my tears. I was just thinking that how fast our feelings reach to Baba and He fulfills all our wishes. In April 2006, I was on the way to Mumbai after visiting Shirdi. I started for Mumbai in the night by bus with my younger brother Satya Prakash Dubey, who lives in Shirdi. We reached early morning and get down at Dadar. After daily routine, we went to Sai temple just outside at Dadar railway station. Since I was standing outside the temple, my brother called me inside for Darshan and Ashirwad. After that I went to my office and brother went to meet his friends and relatives. After completing my work in Mumbai, I took a night bus and reached Shirdi early morning. I decided to go home after the Kakad Aarti. While sitting outside the Samadhi Mandir, I saw that Guru Ji “Aadarniya Shri Pramod Medhi Ji” is coming. I went and did Charan Sparsh. He asked me, “BHAIYA KAB AAYE, CHALO KAKAD AARTI KE LIYE” (When did you come, let’s go for Aarti). I went inside the Samadhi Mandir and stood just in front of Baba. After Kakad Aarti and Mangal Snan, I reached home and explained everything to my brother. Then he told me that I hope the things are now clear to you that why Baba called you inside the temple at Dadar. Because He has already decided that you have to attend the Kakad Aarti today in Shirdi. If you will this feeling in your mind, how can you go inside the temple? Since you have not taken bath after your daily morning routine, you will hesitate to enter in Samadhi Mandir. But what is IMPORTANT for BABA is that you are clean from inside. No matter if you have not clean from outside, He will take you in His Sharan because He is our father and for father the son is always His son. Anonymous Devotee from India says: Om Sai Ram. I would like to share two of my recent experiences. Baba is great and karunamayee (compassionate). My marriage has been fixed with Sai's grace, but things are not proceeding. The date is not yet fixed and the groom's sides are not so keen on getting us married in Sai's temple. So I was feeling very anxious and constantly praying Baba to make things move smoothly with His blessings. I usually read the experiences of devotees on the blog every day. Today morning, I thought that if I read an experience on the blog related to a marriage, then I would consider it as a Positive signal from Baba and feel that He's willing for my marriage and that I have His blessings. And finally I did read the last post here that's related to a wedding. Baba is so merciful. Am happy now and am sure Baba is listening to our prayers and He will only arrange everything. Baba, help us to surrender everything at Your lotus feet and let everything in our lives happen as per Your wishes and with Your blessings. I was facing issues at my workplace too. I wanted to move into a different area of work, which was as per my interest and I felt comfortable doing that. But in my current position, I was loaded with some project work, which was difficult for me to deliver in a short span of time and I did not have experience on it. I Prayed Baba to help me find a more suitable and better job soon. Through Question and Answer Baba asked me to read the autobiography of Shri Swami Samarth. I found a similar book online (A short biography of Akkalkot Niwasi Shree Swami Samarth Maharaj) and started reading it. In the meantime, I was doing the 9 Guruvar Vrat. I got one call for interview on one of those Thursdays from the company I am so coveted to work for. In my heart of hearts, I had a belief that I would get selected this time, as I was rejected the previous two times for the same company. It’s one of the best organizations in the field of their work and a well known company in the US. The interviews were very tough. But I prayed Sai to make the interviews smooth and to ask me questions that I was confident on. By Baba’s grace, the interview went on fine and I could answer the majority of the questions satisfactorily. They selected me and I received the offer letter yesterday. The pay package is also great, and Sai has given me more than I deserved and ever imagined. It’s a dream come true for me to work for this organization. Moreover, my fiancé also works in the same campus and it will be convenient for us to travel to work together to the same Tech Park after marriage, which is being planned in our families to be held in the near future. Sai fulfilled this wish of mine too, as I wanted our offices to be close by. I cannot thank Baba enough. I would like to mention that I keep reading the Sai Prerna, when I pray Baba to fulfill some wish. My humble salutations at your lotus feet Gurudev, please make us better human beings with every passing day and make us worthy to receive Your grace. May Deva bless us all always. Nice and heart touching experiences. May baba help his devotees in the same. Jai Sai Ram,Love to read all experiences. Jai Sai Ram. All the experiences are amazing..
Sai baba i love you alott.. I can relate to the last two experiences..
thanx for sharing a nice eperince.baba will always bless both u.
hey sai nath whts goigng on with me.u r giving me a litel happiness and hopes and same time giving sad alao.yesterday was good for me as my husband talked to nicely but wht he said at nite is not good for a husband for his wife.when he spoke such kind of lines for ur devotee then can't u control his mouth before he speaks like that. baba today i started giving bibhuti to him by keeping faith on u that u will make him change soon.please baba make us as husband wife sooon.by keeping faith on u i got married to him and in which cicumtances i got him married and how m suffering mentaly from the day 1 of my wedding which i hav never expected as im ur child. if anything bad in my past karma thn baba plz wife it out with ur blessings .aur sehen nehi hota.do something as soon as possbel baba. ANANTHA KOTI BRAHMANDA NAYAKA RAJADHI RAJA YOGI RAJA PARA BRAHMA SHRI SACHIDANANDA SAMARTHA SADGURU SAINATH MAHARAJ KI JAI. I LOVE YOU SO MUCH BABA. BABA PLEASE EXCUSE ME BABA FOR MY MISTAKES BABA. Thanks for sharing such wonderful experiences with all of us. Very wonderful experiences! Sreenivas Ji, your story of the tumor shrinking is simply amazing, and it is only due to Baba's grace that you are now healthy. It is wonderful that Baba cured you! Bal Krishna Ji, it is very nice how Baba made sure that you got the Prasad by delivering it through the lady who came to you and gave you some (as Baba knew your thoughts and arranged for Prasadam for you). Devotee from India, it is wonderful how Baba arranged for a nice job that is convenient for you and your husband. I'm sure Baba will also arrange your wedding plans so everything works out very well. We should just leave the planning to Baba, who better to plan things in our life than Baba (who will arrange for what we desire to happen at the optimal time?). Om Sai Ram! Thanks a lot to all for their best wishes. This experience of mine ' Baba gave me ny dream job' was posted on 21.5.2012 Monday and i joined my job also on the same day !! It is amazing how wonderfully well Baba plans and arranges everything :) He is the inner ruler of us all. My joining was postponed from 17.5.2012 to 21.5.2012 and now i know why Baba postponed it. My marriage date is also fixed now to be held on 9th of July in Baba's temple in my hometown. And i have left all the planning to Deva. He will do it in the best way beyond our imagination. My father expired long back and so i do not know who will do my Kanyadaan and the marriage rituals. Am a liitle worried about it as my relatives have not been so good to us and we have not bene able to convey this to the groom's side. I just pray that Baba should only come and do my kanyadaan. I know he will ! I trust you entirely Baba and i know you will arrange everything well. Love you lots Baba and many thanks to you for everything. May Baba bless us all always.